How do you assess qualitative differences in student work? focus on qualitative differences between students’ responses. The framework called the SOLO Taxonomy. SOLO Taxonomy has 5 levels in assessing differences in student work. The first three are quantitative phases and the second two are qualitative phases. What causes the traffic problem in Sydney? The traffic is always bad. The traffic problem is caused by cars. This answer avoids the question. Repeats the question and fails to make a genuine attempt to tackle the question. We have a traffic problem in Sydney because there are too many cars. This answer is based on only one relevant aspect of the task, its conclusion is limited and dogmatic. There are too many cars in Sydney and there are not enough roads and the Government does not control the traffic well. There is always a traffic jam. overused roads requiring regular maintenance which further reduces usable road space. poor traffic management/ poor city planning leading to ineffective road use. This is a good answer offering connected ideas and logically related points. A response of this nature addresses the question set and deserves a good solid mark. 5. Fifth response to this task is also logically related. But this response does much more. It has an unanticipated extension to the question asked. The student has really thought about the question. Discuss the causes of the traffic problem and their interrelations. Point out that like many other social problems, the key issue is proper management of limited resources. Suggests research should be conducted to identify the key problem area. Compares the situation in Sydney with that of Melbourne and Singapore. This is an excellent answer offering not only a logically related response to the task given but goes beyond, offering an unanticipated extension to the question. 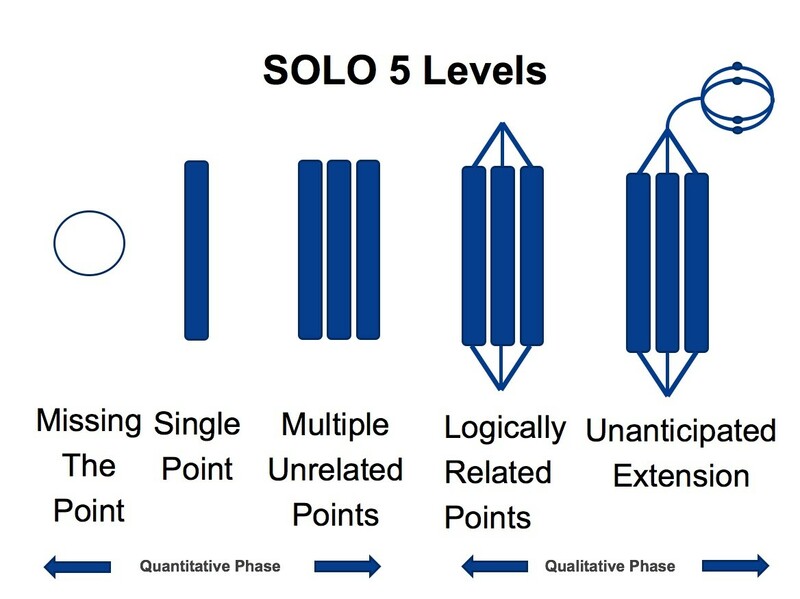 The SOLO has 5 levels, designed to be used to assess differences in student work. SOLO is useful in structuring feedback to students. Traffic problem example used is adapted from a similar task first developed in CLEAR, Chinese University of Hong Kong. Biggs, J.B. & Tang, C. (2011). Teaching for Quality Learning at University. (4th ed.). Maidenhead: McGraw Hill Education & Open University Press. Biggs, J. (1995). Assessing for learning: Some dimensions underlying new approaches to educational assessment. The Alberta Journal of Educational Research, 41(1), 1-17. Biggs, J.B. & Collis, K.F. (1982). Evaluating the Quality of Learning. The SOLO Taxonomy. New York: Academic Press.